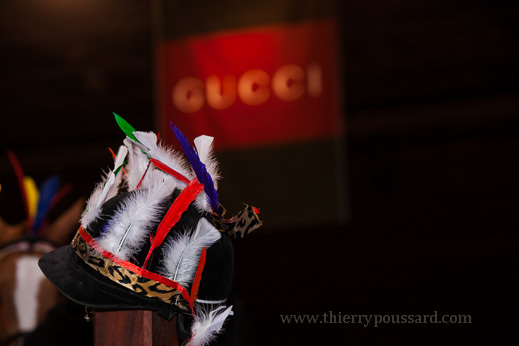 Gucci Paris Masters fans waited eagerly to discover the costumes and themes chosen by the twelve teams taking part in this year’s Style and Competition for AMADE. First up were Charlotte Casiraghi and Edwina Tops-Alexander representing Gucci. They went for a western theme, with Charlotte Casiraghi making a superb squaw, while Edwina Tops-Alexander was the classic cow-girl. The AMADE Mondiale 1 team was comprised of Cindy Le Guerinais and Hannah Selleck, or should we say Princess Leia, as their chosen theme was of course Star Wars. For Longines, Louise Rochefort and Jane Richard, official ambassadress for Longines, decided to go with the brand’s own slogan – « Elegance is an attitude » – as their theme. Paired with Electra Niarchos in the AMADE Mondiale 2 team, Thierry Rozier put on a real show dressed as a prehistoric man, even jumping some of the obstacles with a hand over his eyes! Representing Parc Astérix, Benjamin Castaldi and Roger-Yves Bost were dressed as Roman legionaries. Cécile Laurent and Igor Kawiak, riding for IGF, played the roles of a married couple – but with the roles reversed – something that didn’t go down well with Neuf Decoeur, who failed to appreciate his rider’s veil! For the AMADE Mondiale 3 team, Ekaterina Ryboloveva and Olivier Philippaerts took their inspiration from pop group Aqua and their hit Barbie Girl, to great effect. Riding under the banner of Equidia Life, Julien Courbet – or rather James Bond – heroically rescued Pénélope Leprevost from the clutches of the baddies, before going on to jump the course to the accompaniment of « Skyfall » by Adele. Nicolas Canteloup and Jérôme Hurel‘s wacky – and decidedly topical – entrance into the ring will go down in the history of the event! The pair trotted in astride two donkeys, and wearing bibs bearing the names Fillon and Copé, the two politicians currently battling for leadership of their party. The EADS team went on to swap their donkeys for horses, and jumped the course to the strains of some aptly titled tunes, « Copains d’abord » (Friends First), « Je t’aime moi non plus« , and « Once upon a time in the West« . Jessica Springsteen and Alex Hua Tian were dressed as the angel and the devil for Gucci Kids, and chose the Rolling Stones hit « Sympathy for the Devil » as their backing music. La Laiterie de Montaigu was represented by two magnificent musketeers: François Tanguy and Julien Epaillard. And last but not least, for Toubin Clément, Hervé Taieb and Philippe Rozier each chose a theme. The former was dressed as a hippie, while the second played the role of Nicolas, from the TV series « Bonne nuit les petits » (Goodnight Little Ones) – with Teddy Bear in tow! While the jumping competition was won by Ekaterina Ryboloveva and Olivier Philippaerts, the judging panel of Virginie Couperie-Eiffel, Vincent Pérez and Xavier de Moulins voted Charlotte Casiraghi and Edwina Tops-Alexander the most elegant pair. But the real winner of this exhibition-competition was the World Association of Children’s Friends (otherwise known as the AMADA Mondiale), a non-profit NGO whose President is H.R.H. Princess Caroline of Hanover. Tonight’s competition raised a total of 180,000 euros for the organization, which works to promote and protect the rights of the world’s most vulnerable children.